Today is International Mud Day! With all the rain we’ve been having lately, in Ontario, at least, there's a lot to work with! There are endless opportunities with mud to spark children’s imagination and stimulate sensory play. To some mud play may just look like messy fun, but there’s more to it than getting down and dirty with the wet, soft earthy matter found on the ground after the rain. Some of the benefits of mud play are helping children connect with nature, allows for science exploration, and believe it or not, mud play can even make you healthier. According to the latest research mud can strengthen young immune systems by exposing them to various germs and bacteria. The earthy matter we all know to be mud is a science lesson in itself. Children can have endless fun learning and exploring the way mud is made and how it transforms from a gritty solid substance to a liquid with the help of water. Leave it to dry in the sun (that is if you are lucky enough to live in a part of the country that has actually seen the sun recently) and watch it transform into a solid again. Examine mud closely and students may very well see living pebbles, plant matter and maybe little creatures too. It's pretty easy to find mud. So it's an easy way to connect little learners to their outdoor environment even in the most urban of settings. Who wants a gourmet mud pie? Or a fancy mud cake? 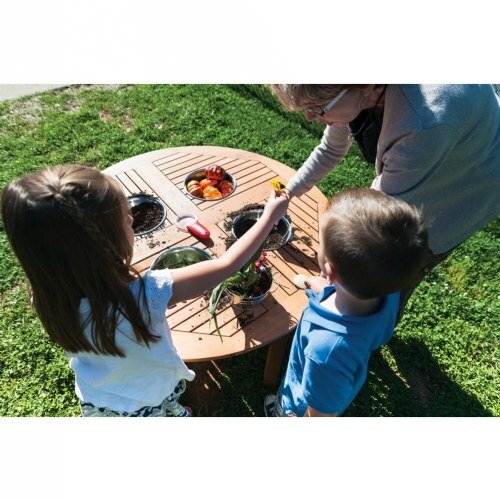 Children can use their imagination and create endless masterpieces with this beautiful eucalyptus wood mud kitchen! It feature’s lots of work-space and a stainless steel sink with a functional water pump. Use mud as a mortar and build with stones, sticks and other materials you can find outside. Building with mud is fun and the possibilities are endless with what you can make. Nurture your children’s inner artist, and create beautiful sculptures with mud. As the mud dries your sculptures will begin to take shape!